Energy storage system producer 24M Technologies spun out of lithium-ion battery maker A123 Systems today to become a separate venture. The company raised a $10 million Series A funding round from Charles River Ventures and North Bridge Venture Partners. The company raised an additional $6 million in a grant from the Department of Energy‘s Advanced Research Projects Agency – Energy (ARPA-E). The funding will help 24M develop batteries that can store more energy for a lower price. 24M’s technology, created in collaboration with A123 and MIT, combines the best of rechargeable batteries, fuel cells and flow batteries to create new energy storage systems. Specifically, the company wants to create batteries that improve on the energy storage capabilities of lithium ion batteries. 24M especially wants to target the transportation and electric grid industries, with the hope of creating more affordable and effective electric car batteries, some of which currently cost upwards of $10,000. A123 will continue its involvement in the venture by helping with product development and commercialization. 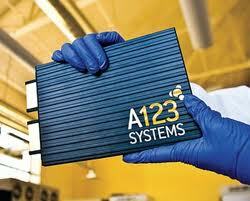 A123 will also receive a seat on 24M’s board of directors and an equity stake in the company. The $6 million grant 24M received comes from the Department of Energy and its APRA-E program. It is intended to help 24M commercialize its products in collaboration with Rutgers and MIT.